PARADOX Media & Vau de Vire proudly present The Edwardian World’s Faire & The 19th Annual Edwardian Ball. Born in the darkened hallows of a San Francisco nightclub, this multi-night, multi-city, multimedia extravaganza has grown over the past nineteen years into an internationally recognized festival of the arts, now presenting a uniquely wonderful Edwardian world with the blessing of The Edward Gorey Charitable Trust. 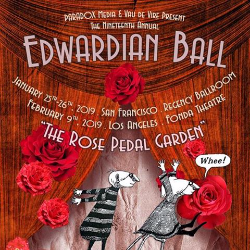 The Edwardian Ball is an elegant and whimsical celebration of art, live music, riveting theatre, fashion, literature, ballroom dancing, DJs, a circus spectacular, technology new & old, and the beloved creations of the late, great author and illustrator Edward Gorey. Set in a romanticized, gilded and gentile Neo-Victorian and Edwardian-era, a gothic and steampunk-tinged distant past intertwine with an elegantly imagined future. The theme for the 2019 season is "The Rose Pedal Garden", featuring a playful, bicycle-powered wonderland set in an enchanted English garden, and featuring our story of the year, Edward Gorey's cranked-up classic, The Epiplectic Bicycle. Opening night of the two-night celebration unfolds with the renowned Edwardian World's Faire. General Admission includes access to the Grand Ballroom, Vendor Bazaar, Museum of Wonders, and all performances. New, improved hot food menu, full bar & absinthe bar for 21+. Limited, non-reservable seating on a first-come, first-served basis. The Edwardian World’s Faire where historic and novel characters intermingle. Enjoy live music, theatre, fashion, circus, fine art, riveting stage shows, literature, ballroom dancing, DJs, and character play. True-life adventures blend with fantastical lands. Live the excitement of the age of exploration, reimagined through the lens of today and beyond. This year's theme is "The Rose Pedal Garden", featuring a bicycle-powered garden of playful wonders, and featuring Gorey's cranked-up classic, "The Epiplectic Bicycle," where characters, tricks, and games of chance weave a backdrop to steam-powered creations and chance encounters. Revel in a modern day Belle Époque where cultures meet, blend, dance, and collide. Edward Gorey's art and sensibilities come alive on Saturday evening which is entirely devoted to the macabre work of the writer and illustrator and the Edwardian era (1901-1910). A bona fide institution, The Edwardian Ball is presented by co-hosts Rosin Coven and Vau de Vire Society. Ballroom dancing leads way to stunning performances both on and offstage in a collage of fashion, theatre, music, circus performance, and dance and pure decadence. General admission includes access to our Grand Ballroom, Vendor Bazaar, Museum of Wonders, and all performances. New, improved hot food menu, full bar & absinthe bar for 21+. Limited, non-reservable seating on a first-come, first-served basis. Impossible to describe, but absolutely delightful to experience The Edwardian Ball!